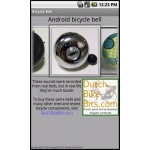 With a weight of 0 g, the www.DutchBikeBits.com Bicycle Bell app is the lightest bicycle bell in the world. With a price of €0 it's also the cheapest bicycle bell in the world. 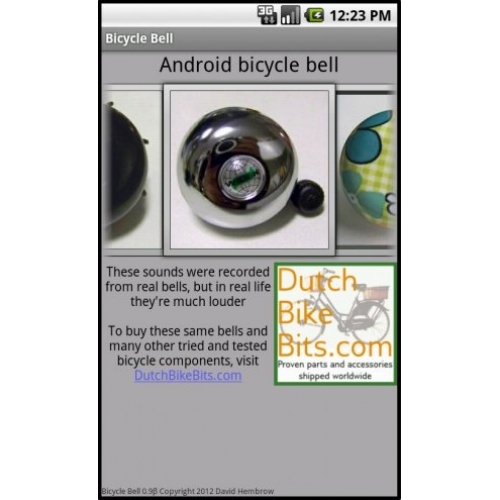 The app allows you to choose between six different bells that we sell. The picture of the bell appears on the screen and the sound of that bell is produced byeither tapping on the screen or by using the "Volume -" key on the side of your phone or tablet. The volume of sound produced by the app will be enough for many purposes, but it can't produce sound that is as loud as the real bells. In 2010 we measured how loud real bells are. Works with any device running Android 2.1 and above. Either add to the shopping cart and use "Free checkout" to be given the download link or download instantly without login by clicking here.